>> How to Secure A Trampoline in Every Possible Way? Trampolines are a part of almost every household now. The reason behind this is they have been responsible for giving fun and entertainment to the individuals, and they are also a great way to exercise. According to various studies, a trampoline helps to burn more calories and is more effective in comparison to the other forms of exercise. However, securing your trampoline is a must. One reason as to why you should secure your trampolines properly is because you can be harmed and injured if you fall out or hit the frames or springs of the trampoline. The other reason is that the trampolines are costly and you cannot afford any kind of damage to your apparatus very often. Trampolines have a huge surface area, and this is a major reason as to why they can blow away when the wind is strong. Even if you place the trampoline in an area that is not prone to winds, you cannot guarantee that a storm won't blow away your trampoline or cause additional damages. If a trampoline flies away, it can get entangled in the power lines and create an extremely dangerous situation. Storms will come and go without your knowledge, and if you are not prepared to face the wrath of a storm, it can be too late. It becomes impossible to do anything when the storm has already arrived. These situations can be prevented easily by using the anchors or the wind stakes. You can purchase the trampoline anchor kits or opt for ratchet straps or the star pickets. Even the good quality trampolines can become notoriously mobile when the weather is stormy. Your garden might be protected with the help of fences or walls, but a strong gust of wind can blow away your trampoline in no time. The damage caused by a trampoline can be heavy as it can ruin not only your property but harm your neighbor's property as well. If you surf the internet, you will come across tales of trampolines being lifted away as well as the damages caused. You can dismantle the entire set up of the trampoline after going through the weather forecast or if you feel that a storm is approaching. However, this has its own drawback. Dismantling and organizing the trampoline time and again can be very hectic. Also, it is not always easy to understand when a storm hits. Therefore, to avoid the risk and hassle, it is necessary to look for a permanent solution. If the trampoline is not being used for a long time, you should lower the safety net. The safety net tends to act as a sail, luring the wind to carry it away. There is no need to take down the poles. When you or your kids want to enjoy, you can easily set up the net. If you take the poles down, setting up the entire thing will become very difficult. And, if you remove the net, the trampoline will not be blown away so easily. Using anchor kits or wind stakes will help in keeping your trampoline tied to the ground. If you do not want to spend a huge sum of money, you can opt for the wind stakes, but if you do not want to compromise with your safety, then purchase the anchor kits despite them being costly. 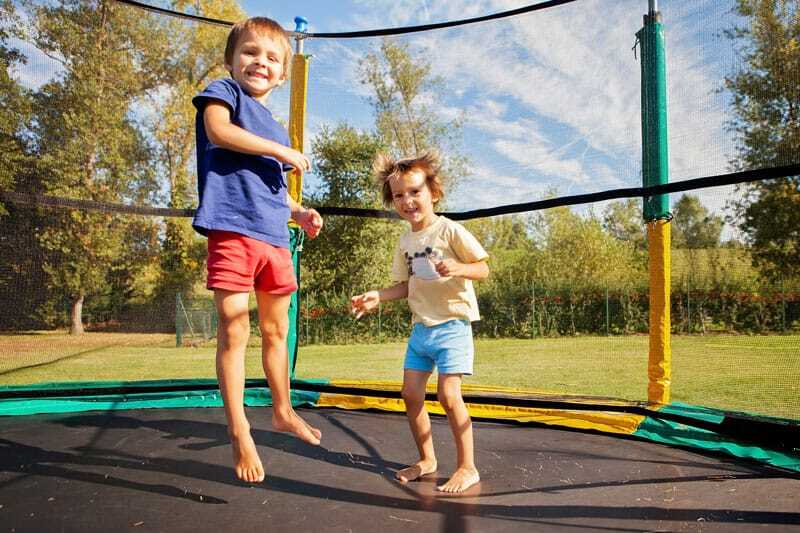 They not only help in securing it to the ground but also ensures that the trampoline does not topple when an over-enthusiastic kid or adult starts jumping on it. Trampoline skirts help in reducing the force and fierceness of the wind that goes under your trampoline and lifts it up. The trampoline skirts play an important role in securing your trampoline and prevent it from getting blown away by the strong winds. You can also try to store the trampoline inside your house or the garage. If your trampoline is large and does not fit inside or occupies a lot of places, you can try the other alternatives mentioned above. If you are not interested in investing in any more money in purchasing skirts, anchors, ratchets, or wind stakes, you can opt for the traditional method of protecting your trampoline. Secure the trampoline with sandbags. Sandbags are heavy, and hence they will not allow your trampoline to blow away. If you live in an area that is windy, keep the sandbags handy. It is necessary to secure the trampoline in every possible way, as you do not want it to become a reason for your stress and anxiety. If you follow these methods, you can keep the trampoline safe and secure.